Description: Byrd's Creek is an easy quilt with an old-fashioned flavor. It is named for a creek in beautiful southwestern Wisconsin. The name seemed fitting because of the subtle colors, much like the shades and hues of bird feathers. Enjoy this fun project! 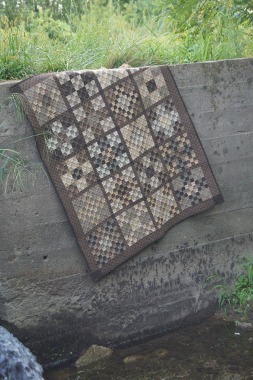 The cover quilt was made using leftovers from a larger quilt kit. Not all fabrics may have \' yard leftover, but there will be enough fabric to make the blocks. The finishing kit will contain the sashing, border, cornerstone and binding fabric.